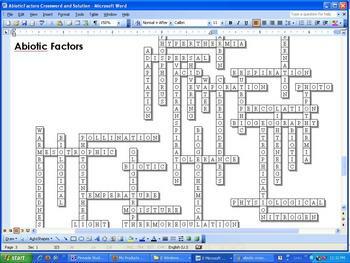 This is a crossword puzzle (Nice resource to have just in case) that goes with my Ecology Abiotic Factors that I offer on TpT. Also included are hundreds of unit PowerPoint slides, the bundled homework package, unit notes, and much more. This unit includes all of the following and more. This Crossword has 37 clues and a word bank that can be removed to make the crossword more challenging if you want. 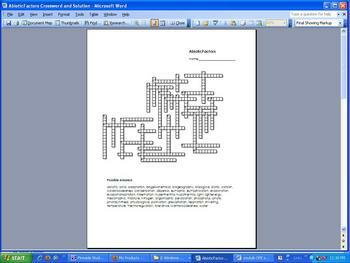 A solution version is also provided after the crossword. Below you will find the word bank, clues, and information about my larger Ecology Abiotic Factors Unit. 3 - This is when water that is so heavy it falls as liquid / solid. 10 - Type of rain that has a lower pH from air pollutants. 15 - This is when a substance changes from a liquid state to gas state (requires energy). 20 - Island __________________ is the study of rates of colonization and extinction of species on islands. 30 - Of, pertaining to, or produced by life or living organisms. 4 - A common nutrient in nutrient pollution. 6 - A process whereby an organism becomes better suited to its habitat. 23 - Maintaining a warm body temperature independent of environmental conditions. 26 - A process that converts carbon dioxide into organic compounds, especially sugars, using the energy from sunlight. Ecology and the Environment: Abiotic Factors Unit- Areas of Focus within The Ecology: Abiotic Factors Unit: Abiotic Factors, Biotic Factors, The Big 7 Abiotic Factors, Organisms Range of Tolerance, Light, How light affects Organisms, Photosynthesis, Factors in the Environment that Affect the Amount of Light, How Organisms Movements are affected by light, Bioluminescence, How temperature affects organisms, Thermoregulation, Physiological Regulation,Behavioral Regulation, Adaptation, Hypothermia, Hyperthermia, Warm-Bloodedness (Endothermy), Cold-Bloodedness, Hibernation / Torpor, Advantages of Warm-Bloodedness, Disadvantages of Warm-Bloodedness, Advantages of Cold-Bloodedness, Disadvantages of Cold-Bloodedness, Water, Water Requirements and Plants, Adaptations of Plants and Water, Adaptations of Animals and Water, Wind, Positives and Negatives of Wind to Organisms, How animals use Wind, How Plants use Wind, Wind Dispersal, Water Dispersal, Animal Seed Dispersal, Fire Ecology, Fire Dependence, Biogeochemical Cycles, Hydrologic Cycle, Carbon Cycle, Photosynthesis, Cellular Respiration, Oxygen-Carbon Dioxide Balance, Nitrogen Cycle, Phosphorus Cycle, Importance of Phosphorus, Nutrients and Aquatic Systems, Eutrophication. I also sell all 20 Science Units as a digital hard good on TpT. 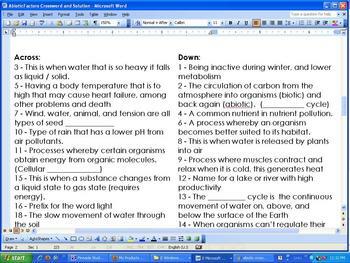 This includes all 20 units (50,000 slides), in Life, Earth, and Physical Science for students in grades 5-10, This also includes 278 pages of bundled homework / assessment that chronologically follows each unit, 175 pages of modified assessments, 325 pages of answer keys, 260 pages of unit notes, 37 PowerPoint review games (5000+ slides), hundreds of lab activities with questions and answers, hundreds of project ideas, 325 videos, hundreds of pages of handouts, First Day Powerpoint, Guidebook, and much more. If you have any questions please feel free to contact me. Thanks again and best wishes. Below are the links to the 20 units of study that I offer on TpT for individual purchase. All of these are included in the curriculum purchase.